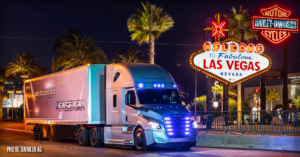 Daimler’s Electric Tractor Trailer: Driving 40-ton eCascadia big rig isn’t just fun, it’s electrifying! Why is Daimler letting me take a massive vehicle out for a spin, during 2019 CES? I don’t have a Class B commercial trucker’s license, and while I’ve driven everything from a Lamborghini Huracán to a Rolls-Royce Wraith, I’ve got no experience with big rigs. Story by John R. Quain / www.digitaltrends.com.